In the area of pressure-sensitive adhesives (PSAs), acrylic PSAs have been successfully applied in many fields, including self-adhesive tapes, sign labels, carrier-free tapes, double-sided tapes and protective films, but applications of heat-resistant acrylic PSAs are relatively rare. 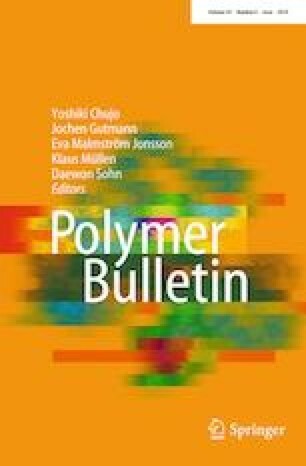 In this study, the thermal stability of acrylic polymer containing maleimide (Mal) functional groups has been investigated. The PSAs were synthesized by acrylic monomers and Mal through copolymerization. The influence of Mal on the viscosity, molecular weight (Mw, Mn), glass transition temperature, thermogravimetric analysis and contact angle of acrylic PSAs was also studied. The adhesion performance and thermal stability of acrylic PSAs could be significantly enhanced by increase in Mal content of the synthesized resin. After 3 h of treatment in drying oven at 170 °C, the modified PSAs can be peeled (180°) off from the substrate without residues on substrate surface at room temperature, while the non-modified acrylic PSAs possessed residues after treatment from 110 °C. The maximum 180° peel strength of modified PSA films was 12.7 N/25 mm when the content of Mal was 7.5 wt%. Xiaoyong Zhang and Huihui Liu have contributed equally to this work.